Best of British! 90 Ball Bingo is a style of bingo most favoured by Brits (although other countries have adopted it too). It has been played in UK bingo halls for decades, and in recent years 90 Ball Bingo has become a massive hit here at Wink Bingo. The game has a classic well thought out structure, that has stood the test of time. Simply mark the squares on your ticket as numbers are called out. We offer 3 winning combinations with some tempting prizes up for the taking. Read on to learn the ins and outs of 90 Ball Bingo. In a 90 Ball Bingo game, a Bingo Caller will shout out numbers between 1-90. Each number is called out once per game. If you get a winning number, you simply mark it on your ticket, and keep doing so until you get a winning BINGO combination. It is customary for 90 Ball Bingo games to be played in clusters of 6 tickets. This way all 90 numbers being called are spread across the cluster, or strip as it’s also known. With more numbers being called out, you’ll have a higher chance of winning! Buying your 90 Ball Bingo tickets couldn’t be easier. Simply top up your account and head to your favourite game room to purchase. You can even buy your tickets in advance and get an alert before your game begins. This way won’t miss out on any fun! 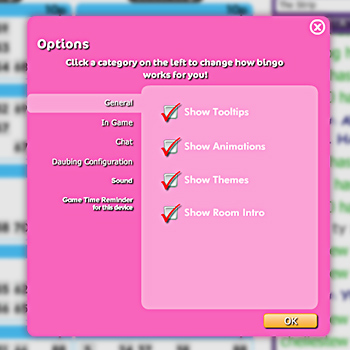 You can pick your Bingo tickets one by one or hit “Click to Select Strip” for a cluster of 6 tickets. If you’re not happy with the selection, you can use the “Get New Strip” feature, to generate a bunch of new numbers. If you are interested in buying a few strips at a time, there’s also a handy “Auto Select Strips” button that will choose the strips of tickets for you. If you don’t like one of the tickets, you can just click to remove, without affecting the remaining selection. What Does It Take to be 90 Ball Bingo Winner? In 90 ball Bingo, you get THREE chances to win in each game! That’s right, 90 Ball Bingo games have three winning patterns, each with its own prize. The winning patterns can be: 1 row, 2 rows or 3 rows. A 3-row win is also called a ‘fullhousel’, The more rows you cover, the bigger the prize. To achieve a winning pattern, all you have to do is mark off (daub) numbers as they are called out by the Bingo Caller. A caller calls the 1-90 numbers out one at a time as they are withdrawn by the bingo system. At every single game, each number may be called out only one time. The first person to get a winning pattern picks up the prize. In a Bingo Hall, the first person to catch a winning pattern shouts out BINGO. Online it’s a bit different. The program will alert you when you get your BINGO. Our Online Bingo games include a handy setting called auto-daub. Auto-daub will automatically mark your numbers for you when they are called out, saving you the trouble. NOTE: At Wink Bingo, regardless of whether you use the auto-daub feature or mark your numbers manually, we won’t let you miss out on a winner. Even if your internet cuts out mid game, our system will keep on daubing on your behalf until you are back online! Win by covering 1 row, 2 rows or ALL 3 rows! plus a useful Game Time Reminder feature. Nothing is set in stone. You can change your settings at any time by simply returning to the Options panel and adjusting accordingly. As well as the Autodaub option that we covered earlier, you’ll also find a Price Alert feature which lets you decide whether you want to display the ticket prices inside the Bingo rooms. There’s also a Show 3TG option, which alerts you when you have 3, 2 or 1 number To Go before a win. Our 90 Ball games are designed for your ease of use. Everything is clearly labeled. Once you’ve purchased your Bingo tickets, you’ll see a ‘Game Starts’ ticker on the top left of your screen that lets you know exactly when your game is due to begin. In the game itself, the info display indicates the number of players, plus it shows which prizes are on offer. Prize winners are also displayed throughout the game. To the top left of your screen, you’ll see a Bingo ball with changing numbers. These are the numbers being called out by your Bingo caller. To help you stay on top of your game, you’ll also be able to view the previous 5 calls! The size of a 90 Ball prize can differ depending on the cost of your ticket or the number of players in your game. Generally speaking, if the ticket costs more and there are more people playing, then the prize will be bigger. From time to time, we offer fixed prize games that have a set minimum prize amount, no matter what. Sometimes we throw in extra prizes and treats! It is worth checking the ‘Info’ panel on your ticket to see what jackpots are on offer. You’ll also be able to see the winners and their winning amounts throughout your Bingo game. 90 Ball Bingo is perfect for players who enjoy classic games. 90 Ball Bingo games tend to be longer, with the tension and atmosphere building up over time. Enjoy longer games with multiple prize options, plus the chance to become part of a friendly and bustling Bingo community.